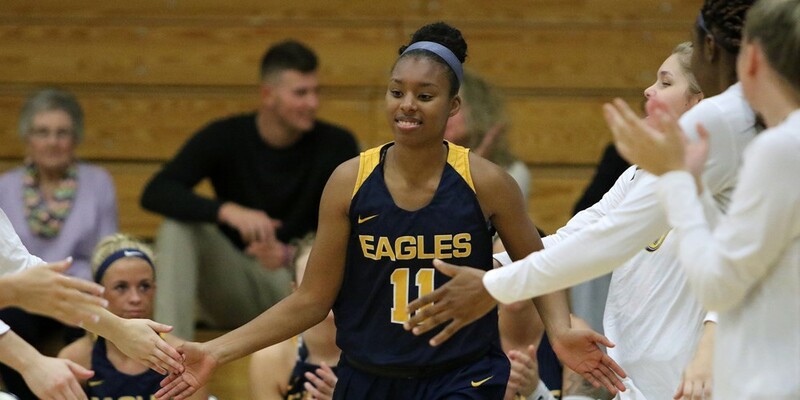 The Reinhardt Lady Eagles looked for a big win as the traveled to Point University on Wednesday night. The past few weeks have been an emotional ride for the Lady Eagles. The Lady Eagles were close in two games with the AAC’s top two teams Milligan College and Bryan College. After keeping both games close, the Lady Eagles ultimately fell in both games. As tournament play is approaching the Lady Eagles are fighting for a spot in post season play. Reinhardt is currently tied with Bluefield for the 8th spot in conference. With six games left, the Lady Eagles will need to secure key wins in order to make it to conference tournament. Point University was the first on many key games. The Reinhardt Lady Eagles fought hard and came out with a deserving win. The win against Point pushed the Lady Eagle’s overall record to be 14-11 and 13-9 in conference. Jada Hubbard led the team with 13 points. Emily Erameh added a double-double of 10 points and a team high 16 rebounds. The Lady Eagles had not beaten Point University at the West Point Gymnasium for over five years, so Wednesday’s win was important. The Lady Eagles play next on Saturday, February 9th at 2 pm against Union College.